Be the first to share your favorite memory, photo or story of J.. This memorial page is dedicated for family, friends and future generations to celebrate the life of their loved one. Joseph Paul Snell - De Pere. 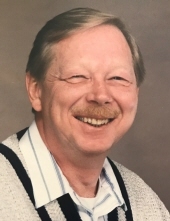 Paul Snell was received into life eternal on November 14, 2018. 2002 from his position as Senior Buyer at Georgia Pacific, or “The Fort”. days on the farm with a large vegetable garden that he loved tending to. He had a quick wit, great sense of humor, a beautiful voice and some serious dance moves. few examples of our fond memories of our husband, father, grandfather, and friend. Hannibal each year and high school reunions. He loved reminiscing with friends and family. The stories of him and his brothers will never be forgotten. Paul is survived by his loving wife, Linda (Seroogy); children, Naomi Snell (special friend, Rick Otto) of Lake Ridge, VA, Joseph Snell (Kelly Conlin) of Berwyn, PA, Valerie (Joel) Tingley and Clara (Brandon) Pickett of De Pere, WI; grandchildren, Isabella, Adrianna, and Alexander Snell, Tyler and Cullen Tingley, Ashley Snell and Lucie and Alayna Pickett. He is further survived by his sister, Doris (Lawrence) Giesbrecht of Horsefly, British Columbia, his brother, Harold Snell of Amarillo, TX, and many cousins, nieces and nephews. He was preceded in death by his parents; three brothers, Ernest Snell, James Snell, Phillip Snell; and his sister-in-law (Phil’s wife), Zulema Snell. Friends and family may gather on Saturday, November 17, 2018 at Incarnation Lutheran Church, 2071 Ninth St., Green Bay, 54304 from 1:00 p.m. until the time of the memorial service at 3:00 p.m. Online condolences may be expressed at www.ryanfh.com. The family would like to give a special thank you to St. Vincent Hospital Regional Dialysis as well as Pastor Ralph Hankermeyer of Incarnation Lutheran Church. To send flowers or a remembrance gift to the family of J. Paul Snell, please visit our Tribute Store. "Email Address" would like to share the life celebration of J. Paul Snell. Click on the "link" to go to share a favorite memory or leave a condolence message for the family.